• Add grilled chicken breast strips or shredded rotisserie chicken breasts for a delicious and healthy meal. • Add dry roasted unsalted slivered almonds or chopped walnuts for a delicious and nutritious crunch. • Add greens and toss well. Place on plates. 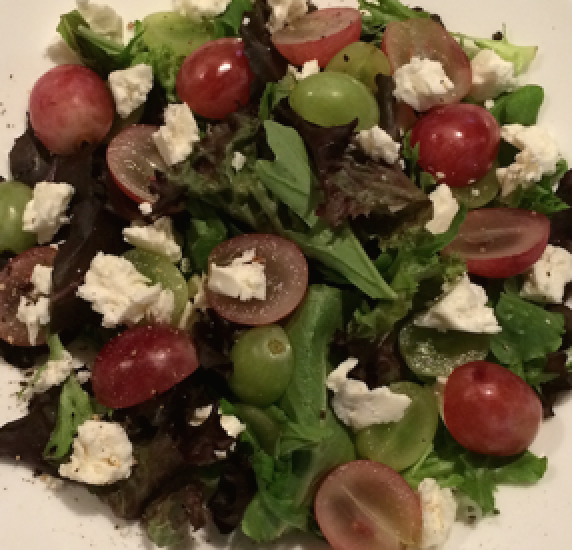 • Scatter cheese and grapes over each plate. Serve immediately. Nutrition Facts Per Serving: 103 Calories, 8g Carbohydrates, 11mg Cholesterol, 7g Fat, 125mg Potassium, 3g Protein, and 190mg Sodium. Resveratrol, found in grapes, dramatically reduces cells’ ability to store fat by about 130 percent. They are a delicious and filling snack, they contain enough sugar to satisfy your sugar needs and keep your weight in control. Grapes improve the blood flow in the arteries. They also promote healthy arteries by helping prevent the oxidation of LDL “bad’ cholesterol, a key contributor for plaque buildup on the walls of the arteries. Grapes are packed with vitamin C, that helps burn body fat. They are also about 80% percent water and will keep you hydrated. Grapes are a rich source of resveratrol, and in a series of studies, resveratrol blocked the development of certain cancers at all three stages of the disease. Grapes contain a a natural mix of antioxidants. Antioxidants prevent damage and repair damage to cells. Grapes purify and clean the entire body inside and out. The resveratrol from grape’s skin has numerous benefits including anti-aging. Massage your face with crushed grapes and rinse after 20 minutes. It will rejuvenate your skin and you’ll love the results. High in antioxidants, grapes help remove the waste produced by physical exercise. Once removed, the body is better able to repair tissue for a faster muscle recovery.